Immediate electronic delivery may be available. Click here for details. Select the Electronic Delivery option when adding the Crystal Reports software to the shopping cart. We will provide a download link and your Crystal Reports license key by email typically within 4 business hours, though some orders may require an additional business day to process. please select the Electronic Delivery option when adding the software to the shopping cart. Select the Physical Shipment option when adding the Crystal Reports software to the shopping cart and choose the standard shipping option during checkout for free shipping. You will receive Crystal Reports license key by email, usually within one business day. Installation media for the Crystal Reports software will be shipped for delivery within 3-5 business days within the United States. You will receive one copy of the installation media with each order. Select the Physical Shipment option when adding the Crystal Reports software to the shopping cart and choose a FedEx Express shipping option during checkout for free shipping. 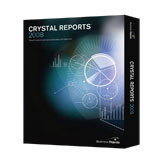 Choose FedEx shipping if you require a retail / shrink-wrapped copy of the Crystal Reports software. We will attempt to ship orders placed after 6:00 PM Eastern Time on the same day and guarantee shipment on the following day. Orders placed on weekends or holidays will ship on the next business day. FedEx shipping is not available for international orders. * Not all FedEx services are available in all delivery areas. FedEx can not delivery to PO boxes.